RUSH: This is Larry, San Antonio, Texas. Great to have you on the program, Larry. How you doing? CALLER: Mucho dittos to our paramount communicator. CALLER: I have a two-part question for you. Do you foresee another undeniable truth since Trump’s election? That would be the first part. And in your esteemed wisdom, should there be a Limbaugh Theorem for Mr. Trump as you opined with his predecessor, albeit quite a difference in the two, I’m certain. RUSH: We get questions somewhat like this. You think you need to redo the 35 Undeniable Truths of Life since those were applicable in the eighties? 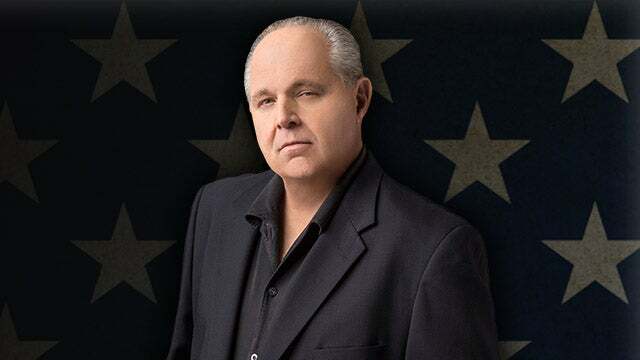 You think, like in your question, had the Limbaugh Theorem to explain how nothing touched Obama, do we need a Limbaugh Theorem to explain something about Trump? Probably so. You know, I totally understand the question. The explanation is that I don’t brainstorm things. Like, Operation Chaos came to me while I was sitting here behind the microphone doing the program. The Undeniable Truths of Life happened when I was writing a newspaper column and had writer’s block. So I just started jotting down one-line thoughts trying to jump-start my brain. And when I got to about 20 of them I said, “You know what? How many of these will I need to get to 750 words and a full column?” So I kept going. The Limbaugh Theorem to explain Obama not being accountable for anything he did also happened while I’m here on the program. It did not happen while I’m at home doing show prep. These things happen spontaneously. So, like in the case of 35 undeniable truths, I did try to do an updated version of them about, I don’t know, four years later. And I found that updated versions of preexisting hits never quite make the mark. It’s kind of like my old analogy. If you have a spontaneous party one night, it’s not planned, but, man, is it fun. People show up you’re not expecting. You don’t really invite anybody, just call ’em. “Hey, we’re getting together, doing this.” People show up and you have the greatest time for four hours. “Man, this is so fun, let’s do it next week,” and you try. And it just isn’t the same. So I don’t push myself in those areas. And this creates long periods of dormancy where some have accused me of having lost my creativity — and I know that’s not what you’re saying. But others have worried, “Rush, are you losing it? It’s been a long time since you updated the 35 –” When they come to me, I do them. And I’ve never sat down and tried to think, “Okay, what do I need?” That’s why I don’t like TV. You can’t do a TV show that way. A TV show has to be planned. That’s why I don’t like doing speeches ’cause I don’t prep those, either. I’m on and my mind’s either gonna be working or it isn’t. And the fact that it might not means a lot of pressure before the speech starts. I’m total improv with everything here.